Hi Goofy Thanks for sharing it seems very interesting. Have you personally tried it at home? I gigged with it for over a year before it busted. Not sure what happened. But it was great! Ryan, I’m not sure what to say. 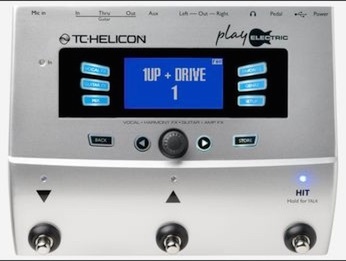 Mine just stopped working in the middle of a gig, and I instead replaced it with the TC-Helicon Harmony G XT that hasn’t given me any trouble and has far more gigs on it than the Play Electric. I’m surprised that this unit has had such issues because TC has long been known for building really high-quality stuff. With my own unit, I tried to the reset and it was just dead… But my Harmony G XT, which has the same harmonizing algorithm as all the Play series (but just missing the effects), has been used in well over 500 gigs, and still works like a charm. It’s also a lot less expensive than the Play.